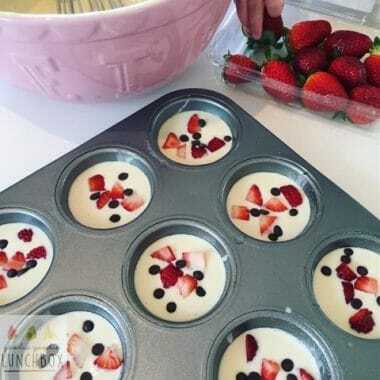 Making pancakes in a muffin tin is something I have only recently come across on Instagram, and when I saw this I knew I had to try. And thus, Fruit and Chocolate Chip Muffin Tin Pancakes were created. I honestly do not know why I had never thought of this before. It’s such a time saver! You can make pancakes without being a slave to your fry pan…yay! I made these Fruit and Chocolate Chip Muffin Tin Pancakes for the first time one morning before school. I had a spare hour so I thought I would make something quick for morning tea. Surprisingly the first batch went pretty well. I say surprisingly because previous recipe testing under stress conditions (ie the time constraints of getting ready for school, finding lost things, yelling at reminding the kids to stay on task) have not made for entirely successful bakes. I used my usual pancake batter recipe for the first batch but they were a bit more puffy than I wanted – much more muffin than pancake. Since then I have tested a few more times until we got the perfect mix. 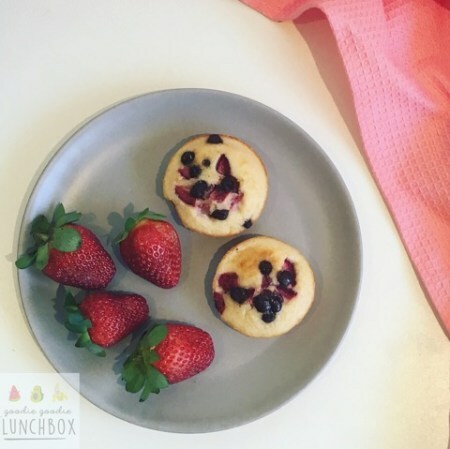 This is such an easy recipe – the kids helped (and helped themselves to strawberries, bananas and chocolate chips) make most of the batches of Fruit and Chocolate Chip Muffin Tin Pancakes with me which I really loved as it’s a win-win, quality time and baking! So now I am ready to share the Fruit and Chocolate Chip Muffin Tin Pancakes love with you. One big tip – I would highly recommend using a silicone muffin tray. I used a regular muffin tin, but as it is quite new it’s still very non-stick and I made sure to grease the tin really well so they did not stick but I think using a silicone muffin tray would make this easier. 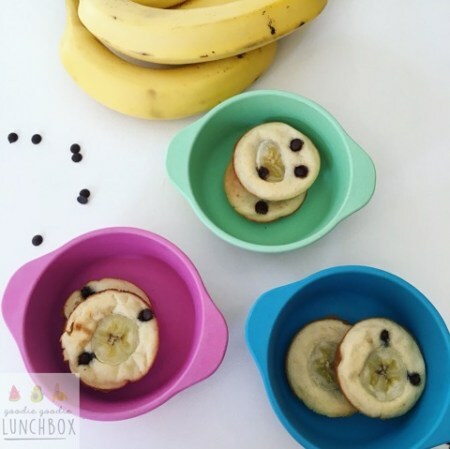 A delicious, quick, kid approved recipe that is great for lunchboxes or snacks. In a large bowl, whisk together the wet ingredients (except for the melted butter) and then slowly whisk in the flour and baking powder into the mixture forming a batter. Bake the puffins in the oven for 12-15 minutes or until they are cooked through. Puffins will not rise like muffins, they will be like pancakes. These Fruit and Chocolate Puffins freeze well, making these a perfect make ahead snack or lunchbox addition. Use within two months of freezing. 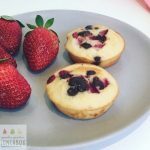 These Fruit and Chocolate Chip Muffin Tin Pancakes freeze well so they are perfect for snacks on the go, and I even grab them for my breakfast if I am running late. I love Puffins for the lunchbox as they are freezer friendly and low in sugar. 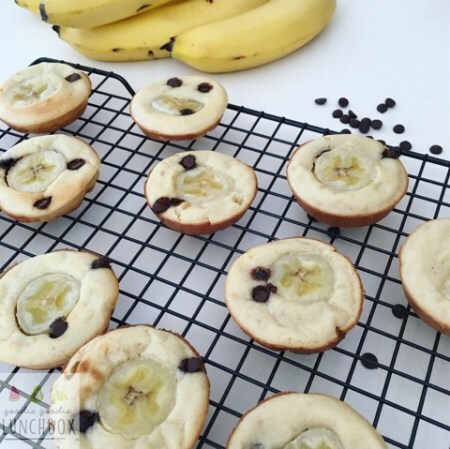 But it’s not just me who loves Fruit and Chocolate Chip Muffin Tin Pancakes – these are totally kid approved. Mr 6 loves the fact they have chocolate chips in them so they seem a lot more decadent than they really are. I hope that you and your family enjoy these delicious Fruit and Chocolate Chip Muffin Tin Pancakes as much as my family and I do. If you do make these, please take a picture and post to my Facebook wall or tag me in your post on Instagram. I really love connecting with you! Enjoy! Just tried these yesterday. They are a massive hit! Half way through making them I thought they might be a bit ordinary but boy was I wrong!!! And my husband can’t stop eating them 😆 Will definitely make again. Thank you!